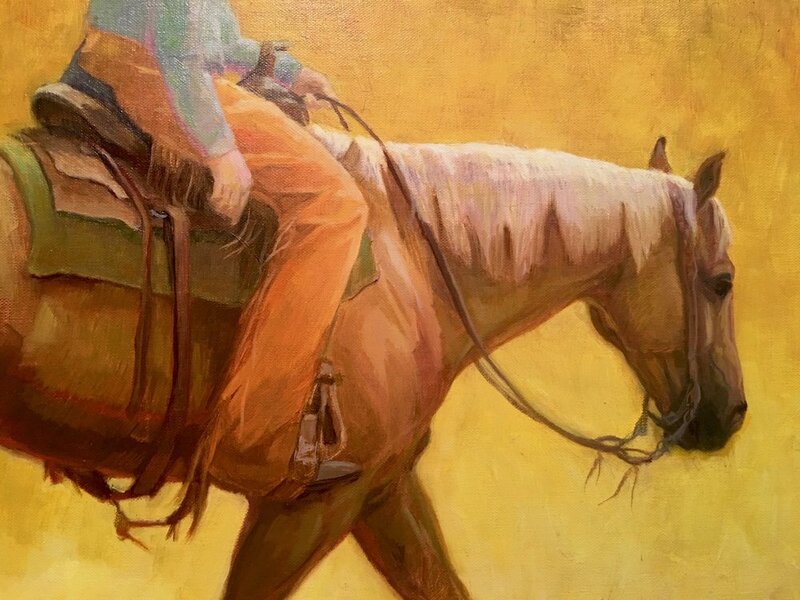 Last month at the 5th annual Art in the Park show at the Rocky Mountain Horse Expo my painting "Violet Team" not only found a new home but was also awarded an Honorable Mention ribbon. Also my "Cowgirl" painting on gold leaf also was taken home by a new collector. Thanks to all the people who ran the show and the other artists as well. I'll look forward to participating again next year! I am proud to report that my painting "Grey Horse on Blue" was honored at the opening of the Fall 2016 show. Now I'm really sad I wasn't there! I do a lot of these little sketches on paper. There is something about the way the paint adheres to the surface that I just love. This shot was taken at the county fair in Pueblo Colorado and had several other riders in the background. I like to simplify backgrounds so all the attention in paid to the horse and rider. I've been working out some ideas for paintings through these small monochromatic sketches and I think they are actually kinda interesting in their own right. Sometimes they help me to figure out the drawing and value aspects of a particular image and sometimes I do them just for fun.